Meet a new budget go-to. The feature set is inclusive, the design aesthetically stunning, and the price is the perfect balance. What more can be said? As a reviewer, it’s far too easy to get caught up in the razzmatazz of full-sized premium cases and bespoke custom towers. Those rectangular boxes that pack every innovative feature known to man into their voluptuously carved forms appear before us like sirens, singing over the sea. Their enticing figures draw us closer, before the reality sets in as to who exactly is serving who here. Sure, they have their purpose, and the market is certainly there for those who can afford such luxury in their computing lives. But those triple-digit transactions are often an unnecessary indulgence. Such halo products are designed with no more purpose in mind than to instill desire into the consumer, to reinforce the premium feel of a brand, and to make its more affordable options—the true buttresses of a manufacturer—more attractive by proxy. It’s the latter part of that calculation that’s the most important. Sure, the flagships may have better margins and the most advanced feature sets, but it’s the sub-$100 boxes—capable of distilling those heavenly attributes and condensing them down into a package that’s both appealing and affordable—that ultimately win the war. The MasterBox Lite 5 RGB is one of those offerings: the culmination of a desire to produce an affordable, market-dominating chassis, with all of Cooler Master’s latest and greatest design touches trimmed to suit a more down-to-earth audience. This is budget done well. For the experienced, a quick glance over the chassis soon reveals which corners have been cut to make form fit function, yet Cooler Master has done this without impacting the end user in any major manner. The transparent front panel is made of a more affordable plastic polymer, not glass. The dust filters, although small, are intuitively placed to ensure maximum coverage of any and all air intake. The hard drive cage, bottom-mounted below the PSU cover, is non-removable and pop-riveted into position. There’s support for four 2.5- inch SSD mounts, with only one bracket included. And a tempered glass side panel is securely fixed in place by a bottom-mounted hinge and just two thumb screws running across the top. The MasterBox Lite is a cunning trickster, a perceptive balance between feature and price. And that’s nothing if not a compliment. So, the features that impressed us? 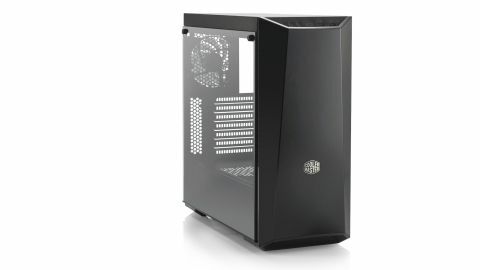 That tempered glass, of course, plus the PSU cover, the support for up to a 360mm AIO in the front, the three included RGB front fans, the ability to rear-mount the 2.5-inch SSD, if you so desire, and the included white or red accents, which you can swap out on the front panel—they all make this case more than desirable. Couple all that with the stellar $70 price tag, and we’re looking at a new budget favorite. There is one flaw in this master plan, however, and it stems from the material used in the chassis as a whole. Now, we get it: This is a budget box for budget builds, and there has to be some drawback. Unfortunately, the plain black steel used across the exterior and interior of the chassis feels thin, and a little lackluster under the thumb. And as we’ve seen the same material used in cases for the last 8 years or so, we just wish there was a touch more effort used on the finish, or something different entirely. But, as that’s our only sticking point, we’ll let it slide. Cooler Master’s MasterBox Lite 5 RGB is a phenomenally priced budget box for any builder looking to construct a modern machine in a case that plays like a flagship. Its feature set is inclusive, its design aesthetically stunning, and its price the perfect balance. What more can be said?